Abang Johari signs the plaque to officially declare the aquatics centre open. Looking on (front, from left) are Pandelela, Juma’ani, Abdul Karim and Snowdan. KUCHING: The state government plans to add three more facilities to support and nurture local sports talents, as well as to grow Sarawak into a sports destination. According to Chief Minister Datuk Patinggi Abang Johari Tun Openg, the expansion would include a velodrome for track cycling, a fully-equipped volleyball court and a badminton academy. 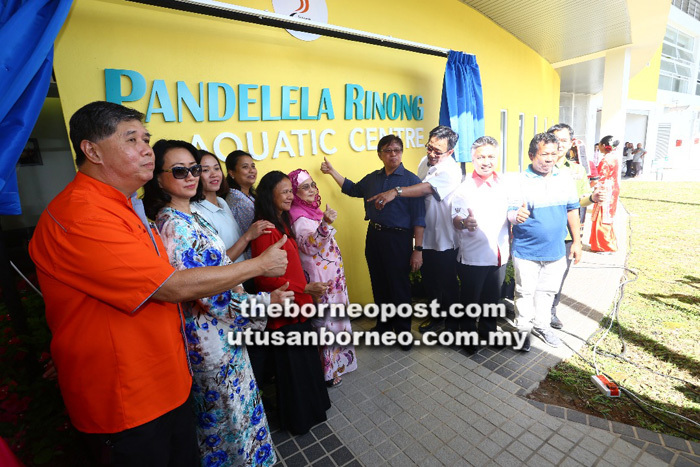 “These are parts of our endeavour to transform Sarawak into a sports powerhouse,” he told reporters in a press conference after the officiating at the opening of Pandelela Rinong Aquatics Centre in Petra Jaya near here yesterday. Abang Johari (fifth right) unveils the section of the wall that displays the name ‘Pandelela Rinong Aquatics Centre’. Witnessing this are Juma’ani on Abang Johari’s right, Abdul Karim (fourth right), Snowdan (third right), Hii (right), Ong (left) and Pandelela’s father Pamg Joheng (second right). Pandelela is on third left, while her mother Hartini Lamim is on Juma’ani’s right. Abang Johari’s wife Datin Patinggi Datuk Juma’ani Tuanku Bujang, Tourism, Arts, Culture, Youth and Sports Minister Datuk Abdul Karim Rahman Hamzah, Assistant Youth and Sports Minister Datuk Snowdan Lawan, Tupong assemblyman Fazzrudin Abdul Rahman, Sarawak State Sports Council (MSNS) director Dr Ong Kong Swee who is also Sarawak Sports Corporation (SSC) chief executive officer, permanent secretary to the ministry Hii Chang Kee, and Olympic medallist in diving Pandelela Rinong Pamg were among those present. “In the past, we lacked sports facilities. A good, world-class training arena is very important in producing and training quality and professional athletes of international standards,” he pointed out. Noting that these facilities would be costly, Abang Johari assured all that he would do his best to source funds, particularly from the oil and gas sector, to materialise these projects so as to enhance and speed up sports development in the state. Elaborating further, he said Sarawak had hosted and will continue to host many international sports activities and events, including the World Para Swimming Championships in July next year, which is expected to host contingents from over 80 countries. Abang Johari added that with these international events coming in, they would offer Sarawak the opportunity to gain exposure and experience not only in sports, but also the hosting of events. and countries. So we must congratulate the ministry for their efforts in pushing Sarawak as a world-class (hosting) venue. “Moreover, it will encourage sports tourism – vital in attracting more young sportsmen and sportswomen to come to Sarawak,” he added. Most importantly, Abang Johari stressed, it would facilitate a platform and also the opportunity for the exchange, learning and networking between local and foreign athletes, which would go towards enhancing the standards and development of sports in Sarawak. Touching on Sarawak’s football development, Abang Johari admitted that the team had not been performing within expectations and thus, the restructuring of the team would be required towards revitalising this sport. “Hopefully we could obtain some money for this – I’ll leave it to Abdul Karim and Snowdan to look into it. We were good before but apparently, that has gone down. I also understand that the association needs support, but we cannot fully depend on the government only. They (association) must be more focused and the restructuring would take time,” he explained. In this regard, Abdul Karim chipped in by stating that it would not only going to be football, but ‘all other sports’. Abang Johari also noted that New Zealand, despite being a small country with a population of four million, managed to win 16 gold medals in the last Olympics. “We can achieve this too if we were to have the facilities, to be more focused and serious in nurturing our young talents especially through the academy because sports, as a whole, is a specialised discipline in itself,” he said. On the Pandelela Rinong Aquatics Centre, which was renamed to honour Malaysia’s diving queen, Abang Johari was proud that the athlete had achieved remarkable success with the support from her parents. “Despite the lack of sports training facilities, she (Pandelela) has become our pride and an international athlete in diving. She is inspires other young athletes to develop their talents and play a key role in sports. “That’s why (setting up of) sports facilities is vital as they become the resources to build and train our athletes,” said the chief minister. The event also held a presentation of financial incentive amounting to RM500,000 to Pandelela.